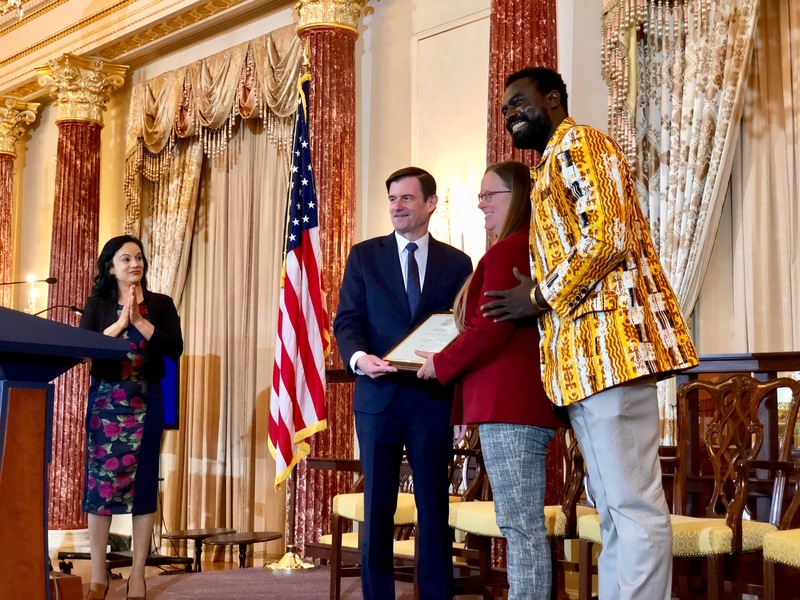 Home Education Alaffia Founders Receive Corporate Excellence Award in Washington, D.C.
WASHINGTON, October 9, 2018 – Under Secretary of State David Hale and Assistant Secretary of State Manisha Singh presented Alaffia co-founders Olowo-n’djo Tchala and Prairie Rose Hyde with the 2018 Award for Corporate Excellence in Women’s Economic Empowerment at a ceremony in Washington, D.C. on Friday, Oct. 5. It is clear that aid alone cannot bring safety to the world and eradicate suffering. What is there to being a human being if we can't contribute to another fellow being? Alaffia was founded in 2003 in the Olympia, Washington garage of husband and wife team, Olowo-n’djo Tchala and Prairie Rose Hyde. Alaffia crafts popular beauty and body care products using traditional African methods. Alaffia is “Fair for Life” certified by ECOCERT (IMO) one of the most renowned international inspection and certification agencies for organic and fair trade accountability. Alaffia’s nonprofit empowerment and sustainability initiatives have resulted in 59,775 trees planted, 34,640 school supply recipients, 8,253 bikes distributed, 25,588 eyeglasses donated, 12 schools constructed and more than 4,800 babies safely delivered in West Africa. To learn more, visit Alaffia.com. The entire award ceremony may be viewed at the U.S. State Dept YouTube channel here. Photos of the October 5 events may be downloaded here.